A combined team from UC Berkeley and Carnegie led by CDAC Academic Partner Raymond Jeanloz and CDAC Director Russell Hemley, and including Paul Loubeyere of the CEA, France and G. W. (Rip) Collins of Livermore, has been awarded time at the National Ignition Facility (NIF) for fundamental science experiments beginning in 2012. The Berkeley-Carnegie proposal, chosen from a group of 86 proposals initially under consideration, outlines work to be carried out on hydrogen and hydrogen-containing low-Z materials at the extreme conditions of pressure and temperature that can only be produced with NIF. Located at Livermore National Laboratory and completed within the past year, NIF houses the world's largest and most powerful laser and has been designed and built to carry out Inertial Confinement Fusion as part of the Laboratory's missions in national security and energy research. Apart from these programmatic goals, however, time at the facility is being made available through a competitive proposal process to academic institutions to carry out basic scientific research. Planning for the Berkeley-Carnegie experiments is currently underway. 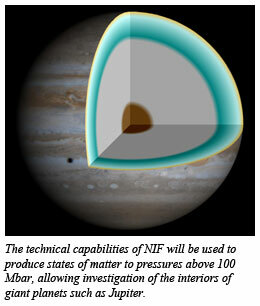 The work will involve collaboration with scientists at NIF and will include postdoctoral fellows and graduate students from the above institutions.